All washing machines control water levels using the exact same system, which works on air pressure. It’s normally reliable but when it goes wrong it can cause overfilling or flooding, problems related to filling and spinning, or trigger an abort with error code. To troubleshoot filling faults you need to understand exactly how the pressure system works. Here’s how a washing machine controls the water levels. There is a small device with several wires on it called a pressure switch. This part should be at the top of the machine under the lid. The pressure switch featured here is an old type, modern ones are much smaller. However, any pressure switch will always have a thin rubber or plastic tube connected to it that runs down to a plastic bottle at the base of the outer drum so that air pressure can switch it on and off. The word pressure chamber sounds grand, but it’s simply a plastic bottle. As water enters the main drum, some of it also enters the pressure chamber bottle attached to the outer tub (or drum). As the level of water increases it forces air up the small tube and when sufficient air pressure is reached, the pressure switch will switch on telling the washing machine to stop filling and start washing. Conversely, when the water gets pumped away, water also drains from the bottle, and this releases the air pressure in the small tubing. Once this happens the spring-loaded switch inside the pressure switch releases and turns off telling the washer that the water has gone, and it’s OK to go into fast spin. 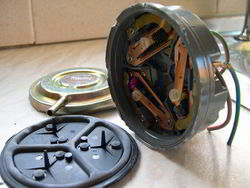 The photo shows inside an old pressure switch. It’s an old triple level one but the principles are the same. A rubber diaphragm lays behind spring loaded switches, each switch needing stronger pressure to operate than the previous one. Air is forced up the small tube and pushes against the rubber and activates the switches. Some pressure switches only have one level, others have two (wash and rinse) and others may have three (wash, rinse and overfill). If you know how many levels it should have you can gently blow up the switch and check the number of clicks. The more wires connected to it the more levels it should have.